(BPT) - Whether you’re staying in place or planning to take advantage of an improving real estate market to sell your home, spring and summer are upgrade seasons. From adding a bathroom to creating an outdoor kitchen, certain improvements pay off for both homeowners who are selling and those who are staying. And while plumbing challenges, such as breaking through concrete or opening walls, may discourage some people, savvy homeowners know a tried-and-true option solves such problems. 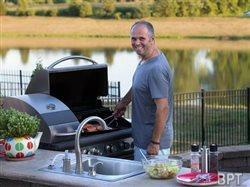 Outdoor cooking areas, complete with sinks and wet bars, are in-demand improvements that boost home value. Often, the improvement starts with an existing concrete or brick patio, or wooden or composite deck. Traditional plumbing would require a contractor to break up patio material or cut into decking to accommodate pipes. Saniflo’s drain pumps make it possible to easily and efficiently install a fully functional sink without the need to disturb existing outdoor structures. When adding a new structure, above-floor plumbing can help reduce costs and construction time for sink installation. While many older homes have laundry facilities in basements or on the ground floor, demand is rising for laundry rooms that are on the same floor as bedrooms. Second-floor laundry rooms are a hot trend in new construction, but it’s also possible to renovate an older home and move the laundry upstairs. Traditional plumbing might require a homeowner to locate a second-floor laundry room adjacent to – or even within – an existing bathroom to take advantage of proximity to pipes. Above-floor plumbing makes it possible to locate laundry facilities where homeowners most need them. Kitchens and bathrooms sell homes, and adding a bathroom is one of the best home-improvement investments. A mid-range bathroom addition returns about 60 percent of the improvement cost at the time of resale, according to Remodeling Magazine’s Cost vs. Value Report. Often, homeowners add a bathroom in a basement or on the first level of a slab-on-grade home. Traditional plumbing commonly requires contractors to cut into concrete foundations or flooring, which can weaken the integrity of the concrete or drive up time and cost if the contractor encounters unexpected problems. Above-floor plumbing eliminates the need to cut into concrete, drastically curtailing the costs, risks and time of adding a bathroom. On upper levels of a home, above-floor plumbing allows homeowners to add a bathroom anywhere they have space for it, rather than limiting them to where in-wall pipes already exist or where space is available to add them. Bathroom and kitchen remodels are also great value-enhancers, returning nearly 69 percent and 72 percent of the investment, respectively, according to Remodeling magazine. Traditional plumbing might limit a redesign so that new fixtures like sinks, tubs and toilets must go in the same spots as the old ones they’re replacing. Above-floor plumbing makes it easy and cost effective to relocate a bathtub into a space that used to be part of a master bedroom closet, or to move a kitchen sink across the room.